First off, a week ago, my quilting of the Samurai Sudoku quilt didn’t turn out as I expected. So there is no quilt to show there as I only am a third of the way quilted and I have to go re-rent time on the longarm to finish. Then I received my round robin quilt that same day. I am working on a couple of posts about my round robin, and no this is not it. I had a whrilwind of a day yesterday trying to figure out some solutions that in the end didn’t work, and that involved my round robin quilt. And now I just need a tiny bit of space from it. Teeny, tiny space. Anyway, I was listening to a lyric of a new song by a band I absolutely adore and this lyric caught my eye. So I made a photo! Or maybe I like this photo better. I also started playing around with pic monkey on my logo. None of these are takers yet, but starting to see if some kind of update is in order (maybe not?). Anyway, that’s where I am at. Looking to be higher, higher, higher, flying with my tapestry of many colored yarns. Thought it sounded quilty. 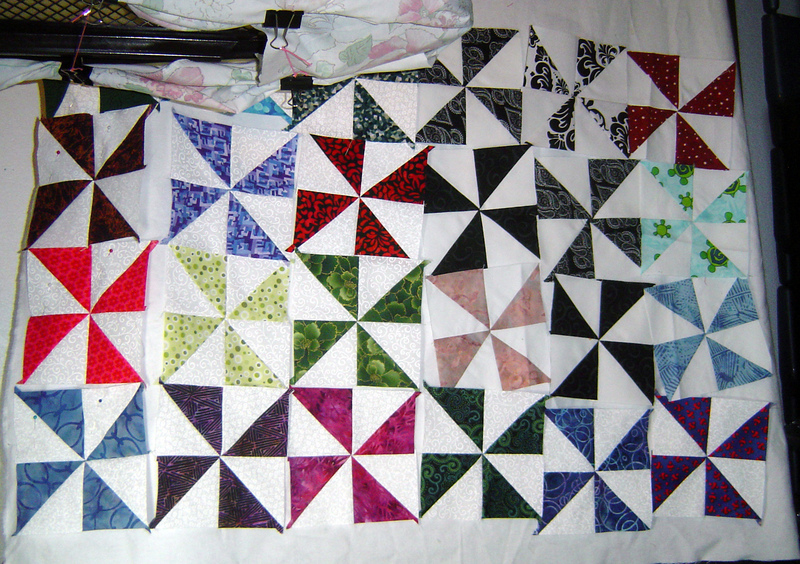 The quilt that has been finished f or a while – I recorded the end of January of 2013, is playing up in my mind for updating with a medallion setting. 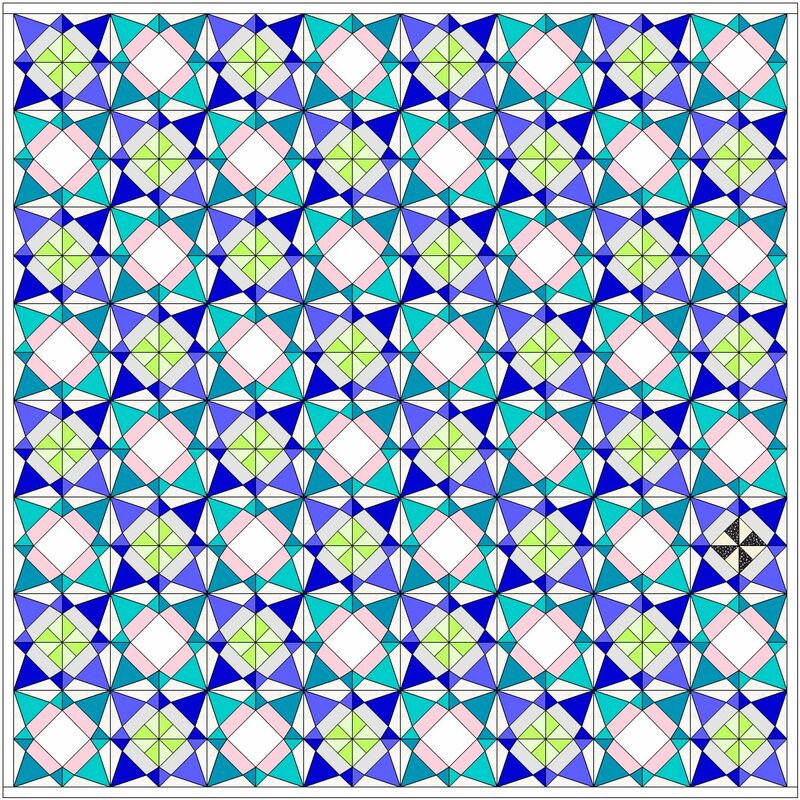 I haven’t got incredibly far with options for this quilt, but I am thinking a couple of things already. 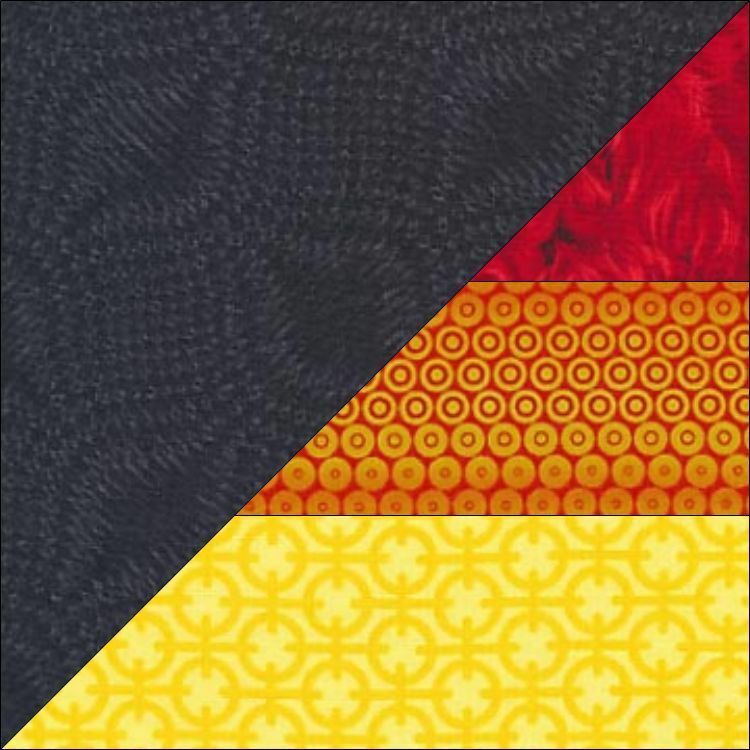 First I have a psuedo-star option which I like – don’t worry about the fabrics being a little busy, I will take care of that later if I chose this option. I may need to go in and edit this block a little bit to make it more intricate. I don’t really like the off-balance I am attempting to do with the light & dark of the magenta, purple, and turquoise in the corners, but I think this may play off well with the alternating blues on the edges. 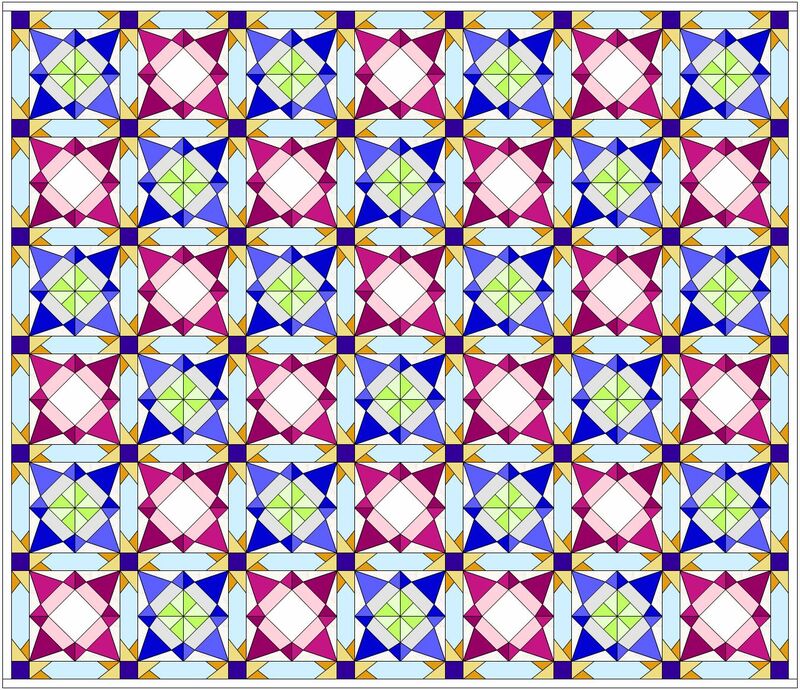 I do like this next design as well, which sorta mocks the dahlia look of the center ribbons quilt. I like the circular look of the turquoise border, and there is a good color sense for the thin strips against the dark blue background, but maybe the points in the corners are not my favorite either. 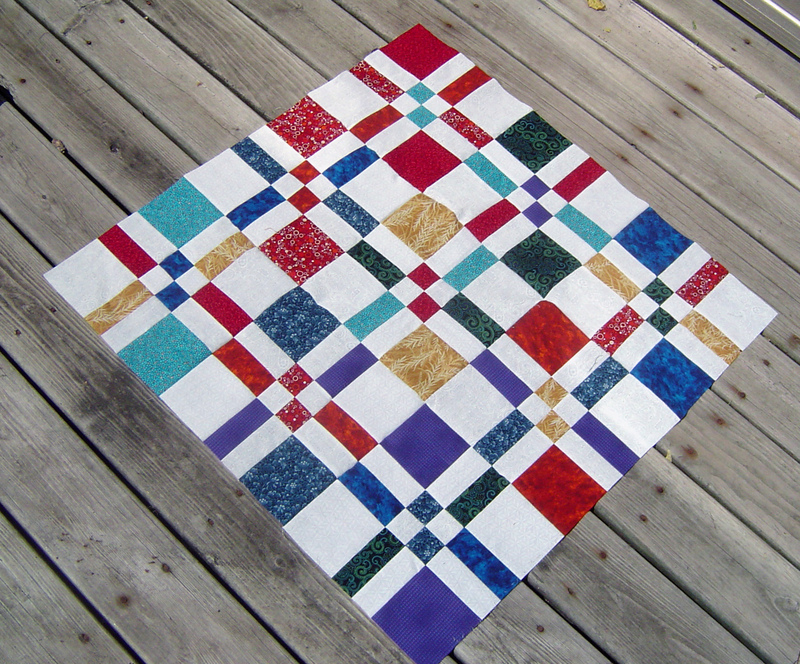 The next design to share uses my good old friend applique in addition to piecing. And I haven’t found the right color balance with it either. But it’s kind of cute. A cute way to frame the quilt without going too overboard. And I could always double ring the applique with a lighter or darker frame as a form of a shadow, which could give a different look. Or I could do this pretty nice balanced block in the corner, but again struggle with how many of each of the 3 colors hit each corner. What I might do is to do some sort of celtic knot in the corners instead. 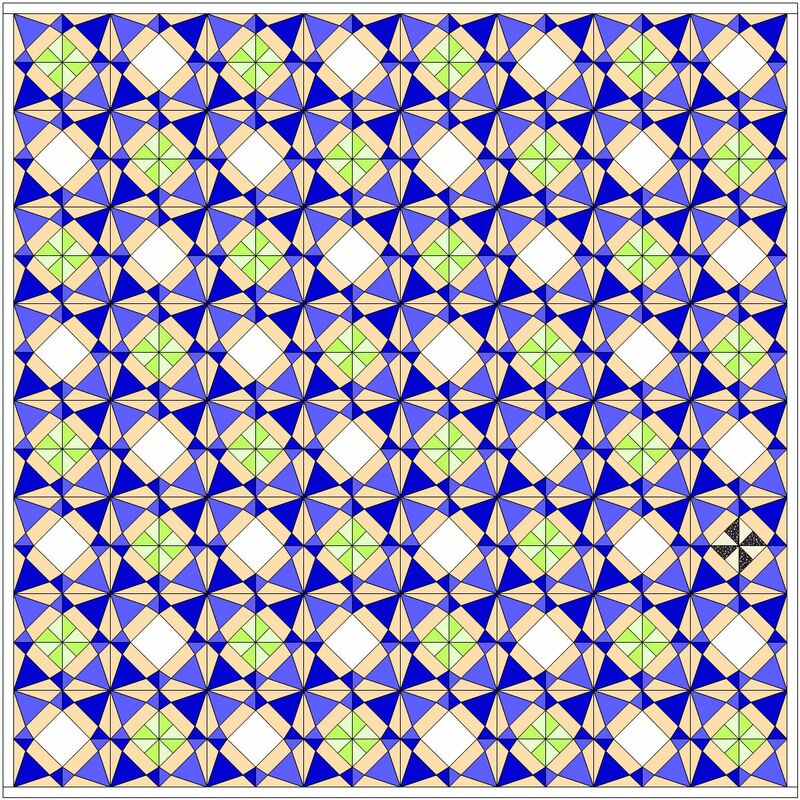 I have a couple of books on celtic knots, and perhaps that will give me more of the look I am dreaming about for this quilt. Need to research & plan and design & think about it. In other somewhat related news, my first round of a round robin was sent off to the next person on our round robin today. I am happy with my portion of the block I received and I hope Daisy will be too. Of course when Daisy sees it, it will look completely different than it does now. I am curious to see what I am getting next, but I am so far, deciding to avoid my “Round Robin Flickr group-A” because I am uncertain if I want to see my block progress or not. DON’T click the above link if you want to see your block and you are in the same group. In other news there are two other groups as well. Group B & Group C. The idea of this round robin is fun. I hope the other two groups get more pictures up – currently there are only 3 pictures and 6 pictures. I just put my hand on the screen to be able to post the link to group A, so I don’t know for certain if there are more pictures or not, but I know a few weeks ago we had 6 or 7 and I just posted one more (without looking). Hoping to see the progress in the other two groups I am not part of, but it’s slightly early for this round as of this time. I really liked the inverse of the block I created, it would have also been a really cool applique center of a round robin quilt. See? (sorta) – small snippet only is available for you. Was going to post the entire inverse block here, but that would be too revealing to what I actually made. Or it could be. And of course these don’t actually line up, I wasn’t being incredibly accurate when placing them down on the sides of the block as those sections are in actuality on the opposite corners of the quilt. It’s a darn good thing I have weekends to sew. Not getting a ton done the rest of the week. Having a happy time sewing & designing today! Ugg. I love / hate the design process. Here’s a short version of a story I’d like to tell more elongatedly. I made a weaving, rectangular, quilt design in February that matches current decor perfectly. “Eh it’s boring”. That quilt is still in pieces, ready to be put into rows, ready for me to decide a clever weaving border for it. … Then there’s been my recent smaller square quilts that I’ve been doing … in addition to the hurricane quilt that hasn’t been touched since I’ve been trying to baste it to remove the oil stain on it (might not remove it all the way, it’s starting to add more character to the hurricane story I’m building around this quilt). and more … “eh, squares are really just not my thing”, “I’m not digging that color”, “can’t you put in some more exciting blocks” …. 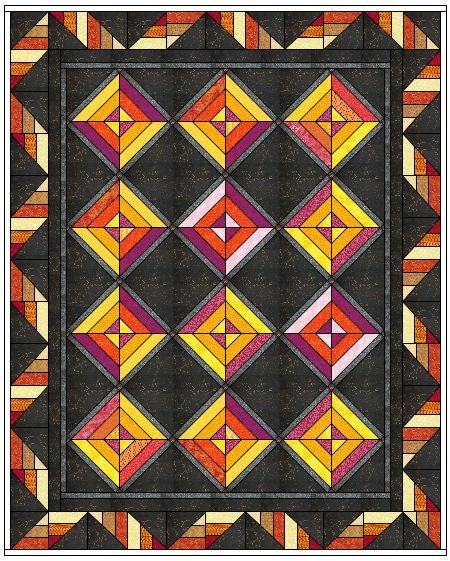 So I was working on the alternate blocks on electric quilt for my latest quilt, Exothermic Wonders, current version that you’ve seen below. This is what I started with. the variation I liked the most of what people also liked the most. But I ran out of black & so did the store. So I got some lower contrast, darker orange /red-orange fabrics for alternate blocks, and I finally put the fabrics into EQ7 this weekend, thinking as long as the blocks are fairly low contrast, there is still the main design. 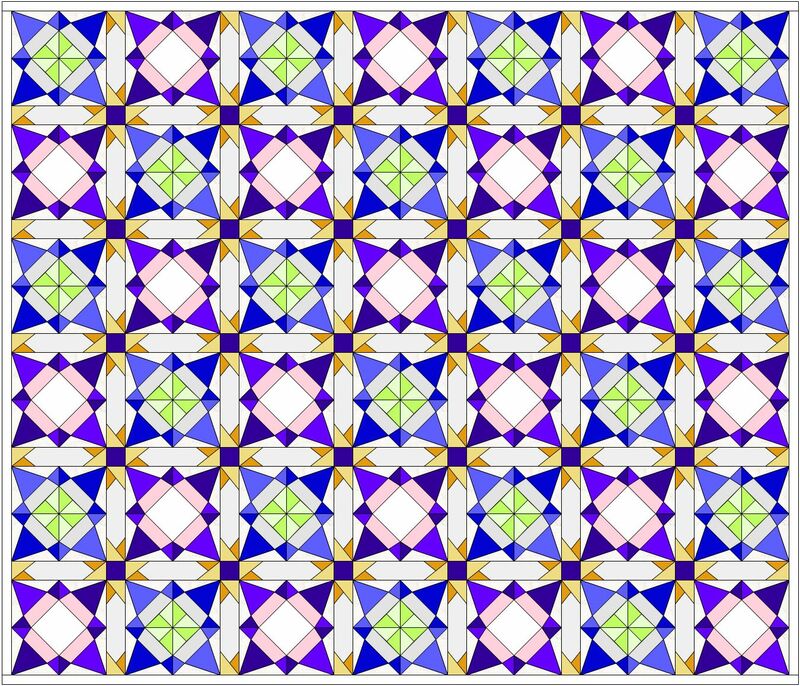 I was working out how much fabric would I need for the alternate blocks as I was designing them, so I removed the outer borders from the electric quilt design, which, I have had completed for at least a month or two. And this was said without the borders, so I quick put the picture above on the screen and say, you mean this one? “No. 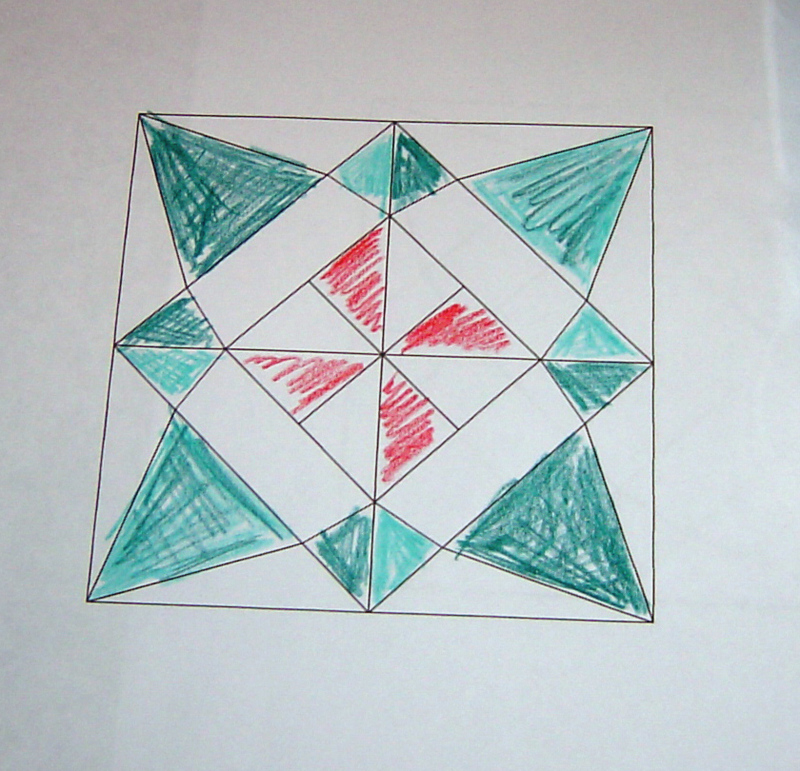 I don’t like the borders.” “Do it without the borders.” “Well, it’s your quilt, and you can do it how you want, but I like it without the borders – too distracting.” “This new design is simple – more symmetrical.” “The borders look too much like the quilt on the inside, same style”. So if I listen to this request, I get a quilt that is ACTUALLY wanted, but then … not large enough. So I need to make more of the middle blocks (that are done & have been sewn together since July, & cut since April), and then, what the heck do I do with all the borders that are also already done? I suppose I could do the back with them, or have a bonus quilt from it? So here’s my new design, assuming I don’t revert back to the border one. Which I do admit, I like (right now). 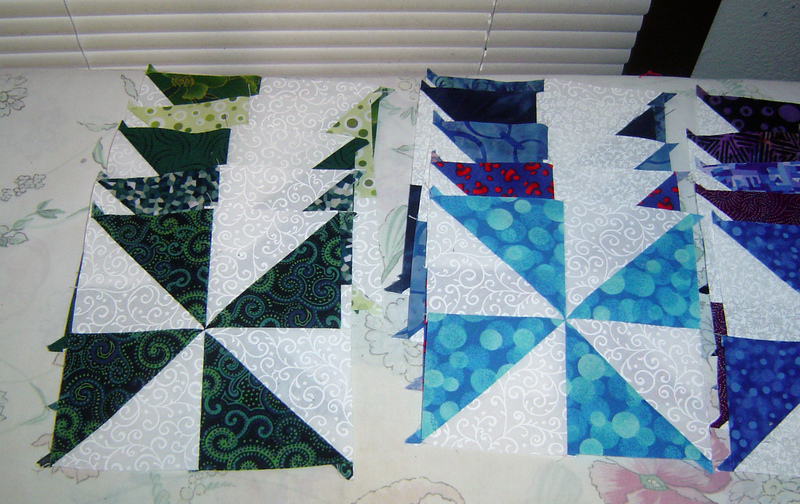 But this means a lot of paper piecing for the alternate blocks. Hopefully I’ll like the end result. Tried putting the borders as alternate blocks, and I almost liked it too, less work, but more scrappy, and I do like how non-scrappy these alternate blocks are. (sorry about the poor quality, it looks better before I post the design, don’t know what’s going on with that). I wrote an e-mail to Nonnie about my podcasting experience through a survey she had sent out on Big Tent. When it got to the editing section, boy did I really analyze the use of my time on podcasts. I will not bore, err, scare, err intimidate, err enlighten you with the lengthy list of things that I do for a podcast, unless requested. The good news is that other podcasters don’t spend anywhere near the time that I do, and so if you’re ever holding back with podcasting because of what I say, just know that I am NOT the norm. Just know that if you’re a slow poke, perfectionist that tends to say the wrong words, stutter, trip over your own tongue, puts together (sometimes) lengthy blog posts, and wants to discuss a topic that has to be researched, that you’ll likely have the same frustration experience as I do. Overall it was a good reality check. My computer was being a pain this morning so I got to sewing… two days in a row. Pinwheels for others (some of them). 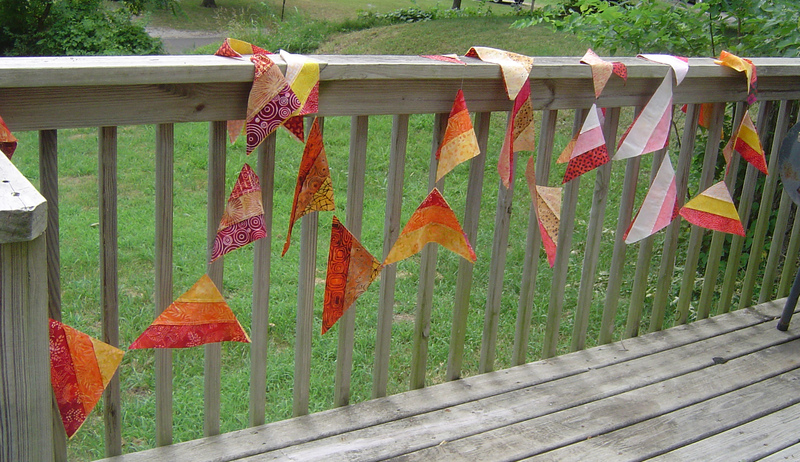 Exothermic something (the orange and yellow quilt) flags, sewing the blocks together – finally. Center of the Disappearing 4 patch sewn together. This disappearing four patch is meant as a practice piece, but I don’t know if it’s useful at this size. Will not tend to hang on the wall, but already took apart and tried the technique. Will see if this will work as a lap quilt with borders. 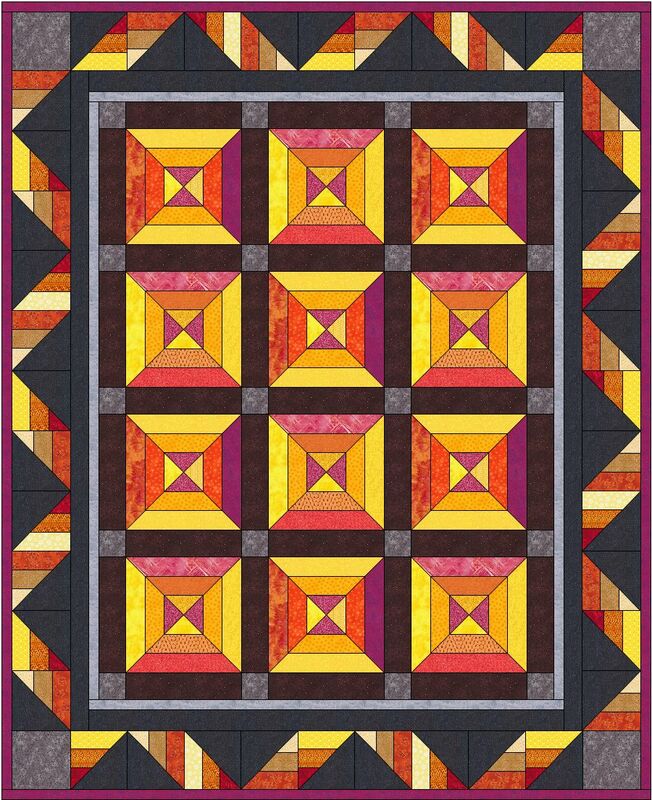 And I worked on both the harlequin quilt top in EQ7 (which gave me my current blog background), and the Exothermic quilt borders. Well the black isn’t in the block yet, so I had to work out the size the block would be first. 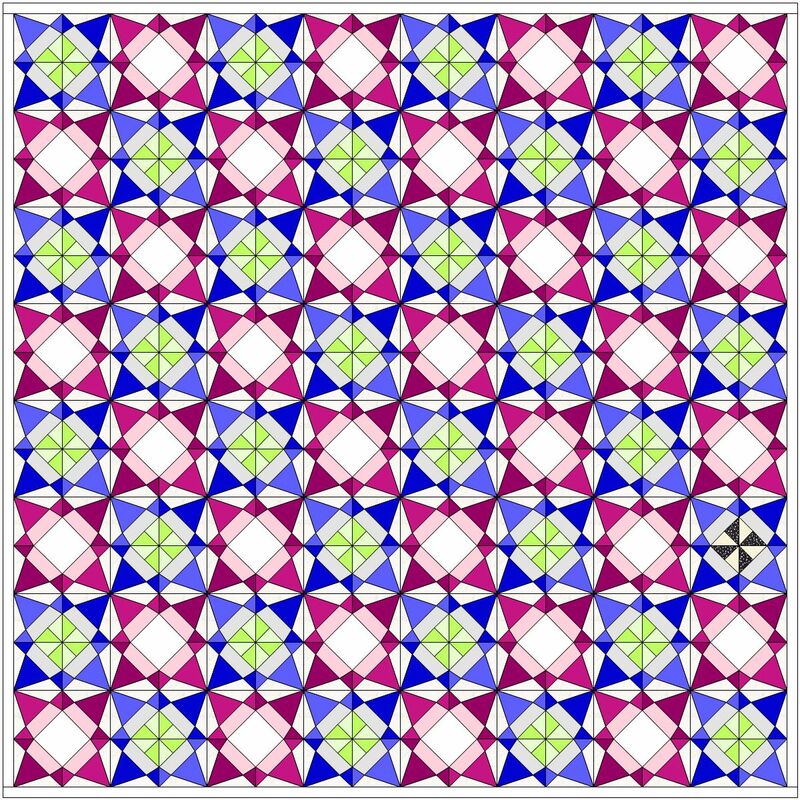 But the direction of the strips limited my initial exothermic quilt design a bit. the strips I thought would be more going along the bias instead of jutting out like this. Which means something different to the design symmetry of the piece. I think I finally got the black and silver border to be the correct width to give the blocks outside the correct height / width. That took me a long time. 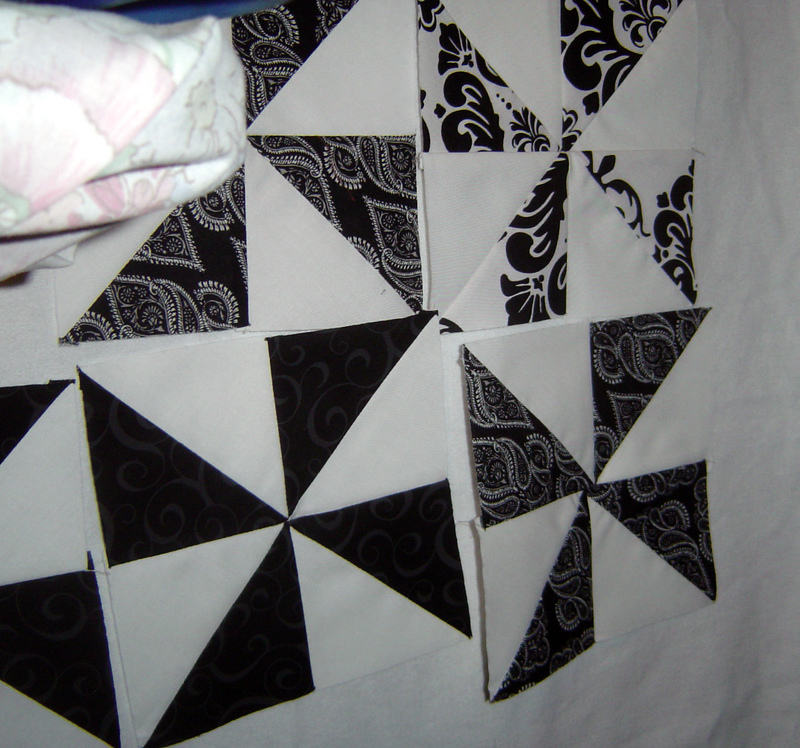 Not so sold on the corner squares in the absolute outer edge, but I am waiting to see if I love this layout or not. 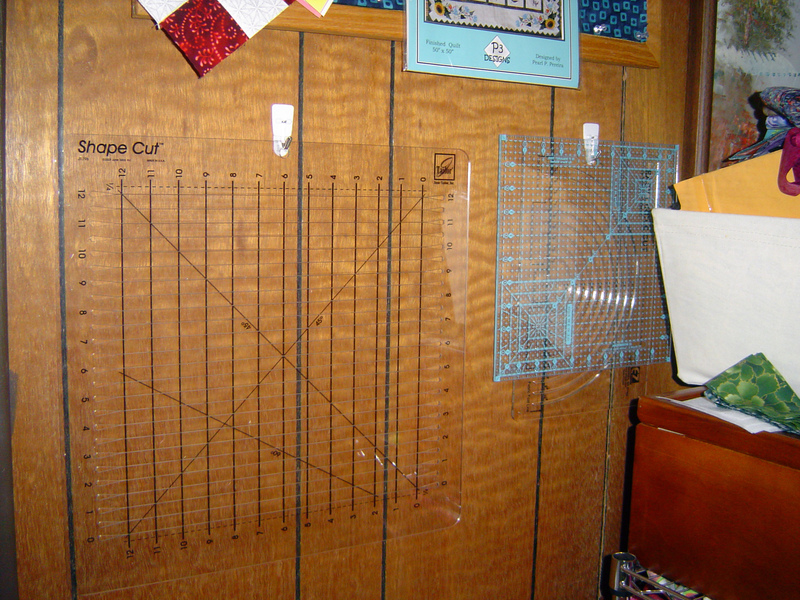 Hard to gauge without going through the trouble of putting in all my fabrics. You are currently browsing the archives for the Computer Manipulation category.